IAEP Local 95 recently participated in a disaster drill with other area first responders at the DCU Center in Worcester, Massachusetts. Local President Bryan Urato used Google Glass while evaluating a volunteer “victim” during the exercise, which was produced by Umass Memorial Medical Center. 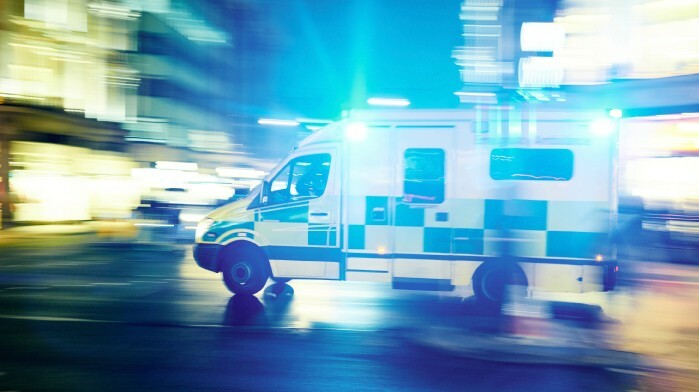 “Continued training and preparedness is crucial for EMS professionals, who are required to respond to a wide variety of dangerous circumstances on the job every day,” said IAEP National Director Phil Petit. Read the full story below, originally posted here. WORCESTER - The DCU Center is often filled with screaming fans. But during a disaster drill Tuesday, the screams were simulating screams of pain. About 100 volunteer victims in orange T-shirts punctuated with bullet holes and fake blood sprawled on the floor of the DCU Center for the disaster drill and a simulated active-shooter exercise Tuesday. Produced by UMass Memorial Medical Center, the exercise was training for first responders, area fire and police departments, and hospital workers who may have to respond to a mass casualty incident. The basic scenario was a shooter opening fire at a live concert. The morning session focused primarily on care of victims, as first responders - with new technology - enter the room after the shooting. A drone flew overhead so paramedics and others could find injured patients and assess the scene. Meanwhile, a paramedic wore a pair of Google Glass glasses to provide real-time evaluation of patients while communicating with doctors. Then about 12:30 p.m., while the band Far From Eden played “Long Train Running” by the Doobie Brothers, there was a loud bang and the crowd hit the floor. A SWAT team entered minutes later, followed later by paramedics, firefighters and other first responders. The “walking wounded” (each volunteer victim was given a card that identified the type and extent of his or her injuries - from walking wounded to deceased) went to St. Vincent Hospital across the street. Ambulances arrived to take other “victims” to UMass Memorial Medical Center campuses in the city. Even an “AmbuBus” operated by the Worcester Regional Transit Authority arrived at the scene to take patients to the hospital. “Today is all about preparing the city of Worcester, and the region of Massachusetts that we live in to respond to an active shooting event, to a mass casualty event,” said Dr. John Broach, an emergency department doctor at UMass Memorial, who was the lead doctor organizing the event. There were several indicators that the scenario was a simulation. “Victims” wore stopwatches in a morning exercise to time how long it took to be reached by paramedics, for instance. Evaluators walked around observing as paramedics helped victims after the shooting. As the ambulances waited for victims to come outside, a civilian drove up and parked right in front of the exit to the triage area. “It was a mixture of boredom, hilarity and scariness, because you have to practice this,” said Matt Robert, one of the “opening musical acts” for the concert. Meanwhile, several organizers and lead participants stressed the importance of preparedness and training, particularly after the arrest of a New Jersey man allegedly responsible for planting bombs in New York and New Jersey last weekend. Worcester EMS has been providing all-paramedic (ALS) emergency response services to the city of Worcester for over 30 years.